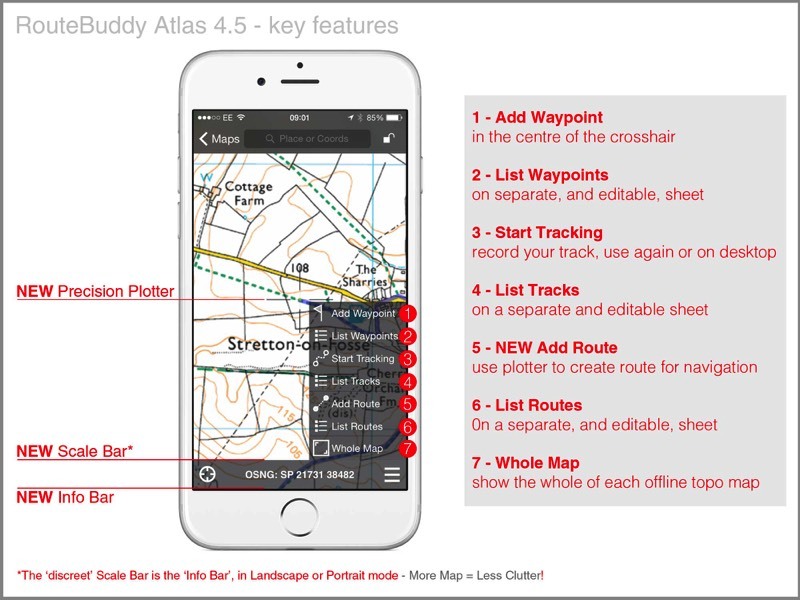 We designed RouteBuddy Atlas to be easy to use. No confusing interface, no login screens and easy map purchase. Not smothered in tiny text and buttons, or with umpteen screens to flip between, Atlas is built for the great outdoors. Quickly and simply access powerful tools and data feedback via Atlas' screen. Route Planning becomes Easy! - use with one finger, or two for speed plotting. Just target the map under the crosshairs, drop a routepoint, then pan map to target and drop the next one. This is a whole new way of planning routes and it is far more accurate than outdated vague and clunky tools. Stay focussed on your navigation. Atlas puts all maps under your control and, with just two taps, you can immediately change scale and type.